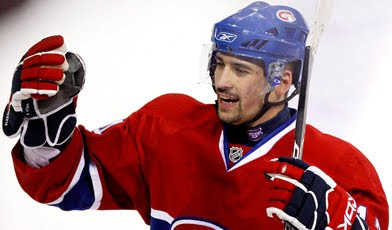 The Habs avoid becoming the Hab-nots today after inking their 2009-'10 scoring leader to a new deal. Pierre Gauthier re-signed centre Tomas Plekanec Tuesday, less than a week after the Montreal Canadiens general manager infuriated some of the team's fanbase by trading playoff hero Jaroslav Halak. Plekanec, who would have been one of the more sought-after unrestricted free agents come July 1, agreed to a deal believed to be six years and $30 million US. The 27-year-old Czech led the Canadiens in regular-season scoring in 2009-10 with 70 points on 25 goals and 45 assists. This deal was a must for the Canadiens. After moving Halak, the Habs had plenty of cap space to bring back their top centre. There just would be no explaining it if they didn't... so, just sign right here Tomas. And here, and here... and initial here. Done deal. Next up for Montreal. Call Lou Lamoriello to see if he would like to continue his "Back to the Future" movement with taking Scott Gomez and his awful contract off their hands.